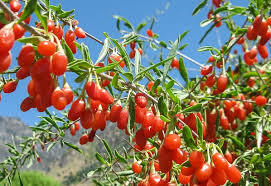 The goji berry is also known as the wolf berry. The scientific name for this berry is Lycium Barbarum. The goji berry is native to the Kahmir Himalayas. Goji berry bushes grow well where there are hot dry summers and fairly cold winters. Goji berries can be grown from seeds either seeds meant to be grown or the commercially available berries meant to be eaten can be grown. The soaking and sprouting step can be helpful; however, it is not absolutely vital to starting your goji berry bushes. If sprouting your seeds simply lay them on damp paper and cover them with more damp paper, keep them moist until they sprout which is usually in about 10 days. If planting the seeds directly, place the seeds into small containers with sterile soil and keep moist in a warm spot. Seedlings should emerge in 4 to 6 weeks. Continue to grow your goji berry bushes in containers until they reach a suitable size to transplant outdoors if in a suitable climate. Otherwise goji berries can be successfully grown in containers indoors. However, goji berry bushes like full sunlight and loose organic soil. Medicinal use of Box Thorn: A sweet tonic decoction made from the fruits is used to lower blood pressure and blood cholesterol levels. It acts mainly on the liver and kidneys. The fruit is taken internally in the treatment of high blood pressure, diabetes, poor eyesight, vertigo, lumbago, impotence and menopausal complaints. The fruit is harvested when fully ripe and is dried for later use. The root bark is a bitter, cooling, antibacterial herb that controls coughs and lowers fevers, blood pressure and blood cholesterol levels. It is taken internally in the treatment of chronic fevers, internal haemorrhages, nosebleeds, tuberculosis, coughs, asthma etc. It is applied externally to treat genital itching. The bark is harvested in the winter and dried for later use. Diuretic, purgative, . The plant has a long history of medicinal use, both as a general, energy restoring tonic and also to cure a wide range of ailments from skin rashes and eyesight problems to diabetes. A tonic tea is made from the leaves. The fruit of many members of this genus is a very rich source of vitamins and minerals, especially in vitamins A, C and E, flavanoids and other bio-active compounds. It is also a fairly good source of essential fatty acids, which is fairly unusual for a fruit. It is being investigated as a food that is capable of reducing the incidence of cancer and also as a means of halting or reversing the growth of cancers.